"It was the fact I was poor, my Dad was in prison, my Mum had no money, I was sick of being picked on." With her south London accent, Kendra Houseman speaks with authority on gang culture. "I was as entrenched as anyone can be," she told Sputnik. "I lived in an area where gang culture was rife but no one really recognized it. We never used that word, we were just a group of young people," Kendra says, revealing the catalyst for her criminal behaviour. "I was a poverty driven child and I couldn't see any other way out, I had no life before street life." "Older people started giving me things and saying if you do this and you can have that. Within a year I was entrenched, selling drugs, exploiting people, robbing people, whatever was happening, I was part of it." "The police were looking for me once and came to my house and found 40 stolen handbags in my bedroom but never did anything about it. I thought I was invincible." 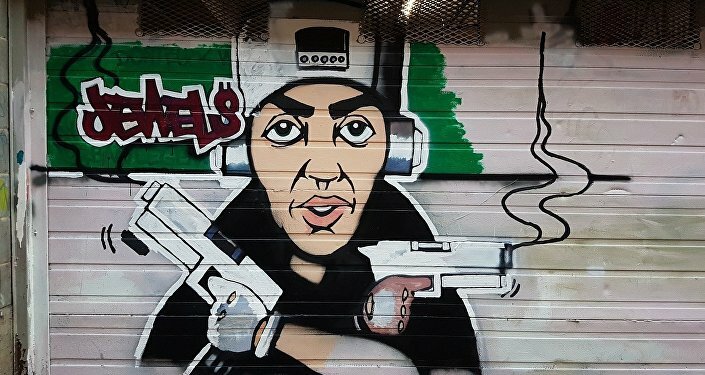 "No Life Before Street Life"
A recent report into gang activity in north east London suggests gang members today are "much more about making money and they will use violence to get what they want." From Postcodes to Profit, How gangs have changed in Waltham Forest, suggests gangs have shifted their focus from defending their postcodes to selling drugs. "It's not really about postcodes any more. It's about money," the report states. However Kendra argues poverty and wanting to make money has always been at the center of gang culture. "I never took drugs, I never had a single fight over a postcode, I was there to make money and that was that," says Kendra. By the age of 14, Kendra could afford to pay her Mother's rent. "That's the reality of it." "I Got Educated, I Got a job, I Got Out"
It was only when Kendra gave birth to her first child when she was 15 years old she realised her life had to change. "I had both my sons really young and I started to realise how dangerous gang life was and my moral compass kicked in." "I looked at my boy aged five and I thought, I don't want him to go and sell drugs. I couldn't just leave but I gradually pulled away." "Before I had my son I had nothing to live for, I had nothing to lose. If I died, it didn't matter." ​Kendra enrolled at college, got a job and slowly extricated herself away from her old life. When Kendra's Mother died, she moved out of London for good, admitting it was the best thing she ever did. Wow….If my mum could see me now. ​Fast forward to 2018 and Kendra is now the Gangs & Child Sexual Exploitation (CSE) Interventions & Protection Manager at a secondary school in Kent where she works with both current and former gang members. "From the age of 11 until I was 15, I took a fast-track class in how to manipulate and make people do what you want; that's what gangs teach you and now I use it for a force for good. I give practical support — which I wish I'd have been given." Kendra, says a new report describing the "ruthless" nature of gangs operating in north east London today is "20 years out of date." "This latest gang report is behind the times," Kendra told Sputnik. "Some of it would be useful for the more inexperienced practitioners, but for me, it's like, 'oh really this is what you're still talking about, don't you know about this already?'" According to figures published by the government's Office for National Statistics, knife crime has increased by 22 percent in England and Wales in the last year, while there was an 11 percent increase in gun crime. Burglary incidents rose by nine percent and car crime, including stealing vehicles increased by 17 percent. "These offences tend to be disproportionately concentrated in London and other metropolitan areas" the ONS says. However, her old life in London still haunts Kendra. "There are things I've done that I'll never speak about. There are things I've seen that still give me nightmares. I've never had a full night sleep," says Kendra. "The worst thing I've done is have weapons in my mum's house without her knowing. I put my mum at risk on a daily basis and I never told her." "I allowed drugs be sold to people I knew who had kids. These things all took place before I was 15," says Kendra. "In order to survive I took out people's lives and I have to live with that; anyone involved in gang culture has to live with that." Kendra asks the question that still keeps her up at night to the young people she mentors today. "I ask them, 'how many addicts do you think you'll create?' It hurts people when I say that. And as someone who managed to escape poverty and the entrenchment of gang culture on London's streets, Kendra's voice needs to be heard back in Britain's capital city among politicians and policy makers. "I'm not here to pretty things up. People are dying, that's the reality."